A classic supernatural tale gets the operatic treatment at the Pittsburgh Jewish Music Festival. "I wanted to update the opera so it wasn't so much about the afterlife and ghosts, but about memory and loss of loved ones." Photo courtesy of Dave Nickersen. 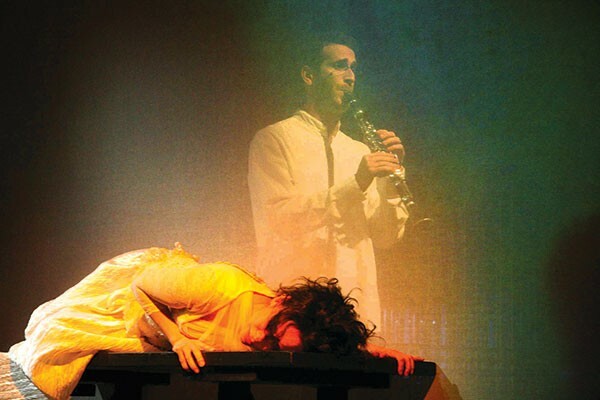 Clarinetist Gilad Harel performs in The Dybbuk. 7:30 p.m. Thu., April 25, and 7:30 p.m. Sun., April 28. That is the central question in Ofer Ben-Amots' multimedia chamber opera The Dybbuk: Between Two Worlds. This retelling of S. Ansky's seminal 1914 Yiddish play of the same name is presented by the Pittsburgh Jewish Music Festival April 25 and 28, at the New Hazlett Theater. Part of the Pittsburgh Symphony's Music for the Spirit Festival, the opera also marks the 10th anniversary of the Pittsburgh Jewish Music Festival. A tale of faith, mysticism and the power of love, The Dybbuk tells the story of Hannan, who was spurned by his lover's family and died of a broken heart, but returns from the grave as a Dybbuk (deceased soul) to take possession of his lover Leah's body. Leah, now near death herself from the experience, must choose between following her lover into the afterlife or remaining among the living without him. Steeped in European Jewish culture and set to Ben-Amots' folk- inspired score, The Dybbuk is the first opera PJMF director/cellist Aron Zelkowicz has mounted and directed for the organization. He says he took some artistic liberties with its libretto. "I wanted to update the opera so it wasn't so much about the afterlife and ghosts, but about memory and loss of loved ones," says Zelkowicz. Most notable is that this 90-minute, three-act opera now incorporates about 50 minutes of dance. The dance is choreographed by Joan Wagman, with contributions from Texture Contemporary Ballet's Alan Obuzor and Kelsey Bartman, and performed by members of Texture. "The music lends itself very well to dance," says Wagman. Zelkowicz also altered the opera's ending. 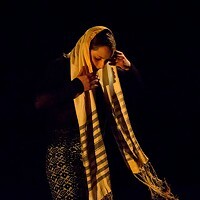 Sung in Hebrew, with English supertitles projected on a screen, The Dybbuk stars Israeli soprano Yahli Toren as Leah. Clarinetist Gilad Harel portrays the spirit of Hannan. Both performers originated their roles at the show's 2008 premiere. "The role of Leah was really cast with Toren's voice in mind," says Zelkowicz. "It is a soprano part but has very low register." The opera also features Duquesne University's voice-department chair, baritone Guenko Guechev; the Pappert Women's Chorale; the Children's Festival Chorus of Pittsburgh; and video art by Sheri Wills.